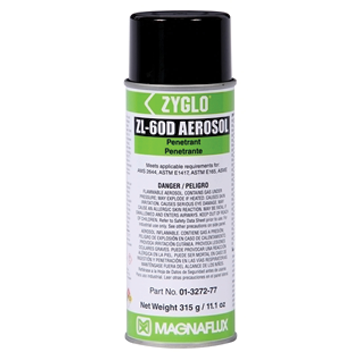 Developed for testing rough machined surfaces, ZL-60D fluorescent water-removeable penetrant is ideal for finding indications in castings, forgings, extrusions and rough surfaces. This medium-sensitivity penetrant washes off parts quickly and easily, leaving less fluorescent background – even on rough surface – for clearer indications and better inspection reliability. ZL-60D is one of the most versatile “work-horse” penetrants, customers can use this one penetrant for a wide range of applications on a range of parts to find many different types of defects, including cracks, seams, laps, cold shuts, laminations and porosity. Broad specification compliance further increase this penetrants flexibility. ZL-60D has excellent alloy compatibility and is safe to use on most engineering and aerospace materials, including aluminum, steel, nickel and titanium. ZL-60D is listed on the QPL SAE AMS 2644 Qualified Product List and is approved for use by Pratt & Whitney. Recommended developers are ZP-4B dry powder, SKD-S2 or ZP-9F solvent-based or ZP-5B water based.